Step into the breathtaking Now Larimar Punta Cana and enjoy a wristband-free, excitement-filled getaway. Far from life's demands. Located on over 700 yards of picturesque palm-studded white sand beach on the majestic turquoise Caribbean Sea in Playa Bávaro, Now Larimar offers all of the privileges of an All-Inclusive escape in an exquisite seaside setting. 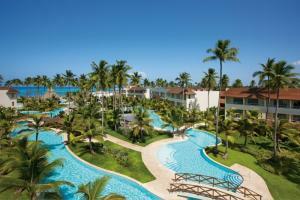 Located 9 miles (15 km) from Punta Cana International Airport.